Renting a Motorhome on holiday gives you unrivalled freedom and independence to explore - whether you intend to pitch at one site and explore the local sights, or take advantage of your mobility and travel around a wider area, it's a relaxing way to spend your holiday. Our international Motorhome Hire Excess Insurance is a low cost as gives you peace of mind. 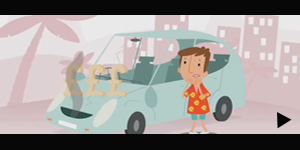 Don't let worries about accident, damage or theft of the vehicle spoil your holiday. Avoid costly collision damage waiver policies from your rental firm. Instead, arrange much more affordable excess cover with our International Motorhome Hire Excess Insurance through Worldwide Insure - for complete peace of mind whilst travelling! 'Collision Damage Waiver' is offered, or included, with most Motorhome Rental Agreements but there is usually a high excess remaining which you would be liable for in the event of a claim. Our motorhome insurance acts in conjunction with CDW, reducing your liability. View frequently asked Questions Can I hire in my Home Country? Who can buy this Insurance? Are there any Age Limits? Where can the vehicle be driven? What types of vehicles can be insured? What vehicles cannot be insured? Do I really need this type of Insurance? UK (inc Channel Islands & Isle of Man), Austria, Belgium, Cyprus, Denmark, Finland, France, Germany, Ireland, Italy, Malta, Netherlands, Norway, Portugal, Spain, Sweden, Switzerland. Drivers must be aged between 24 and 74yrs. A Single Motorhome, Campervan or similar vehicle designed or intended to provide sleeping and living accommodation that does not exceed 7.5 tonnes, rented from a fully-licenced Rental Agency. Yes, if you return the vehicle damaged, even if it was not your fault, you will be held liable for the charge set by the rental company. This insurance enables you to claim back the charges less a £350 excess on Excess Reimbursement claims. There are also other benefits such as mis-fuelling cover.